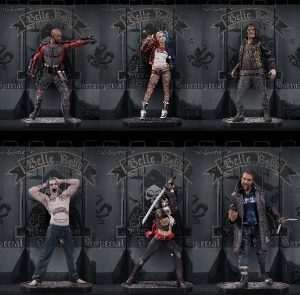 Upcoming Releases for Statue & Toy Collectors! Check out some of the new products coming soon to Royal Collectibles! 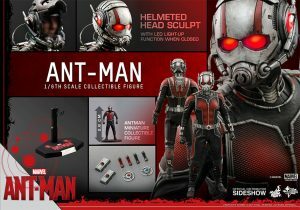 ANT-MAN 1/6 Scale Figure by Hot Toys – The movie-accurate Ant-Man Collectible Figure is specially crafted based on the film and features a newly developed helmeted head sculpt with an authentic likeness of Paul Rudd as Scott Lang. When closed, the helmet features LED light-up eyes. The Ant-Man also includes a specially tailored Ant-Man suit, an Ant-Man miniature figure, detailed accessories and a specially designed figure stand. $239.99 – Coming 1st week of May – Pre-Order today and save $15! 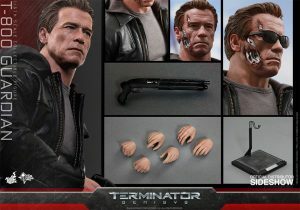 T-800 Guardian 1/6 Scale Figure by Hot Toys – The T-800 Guardian collectible is specially crafted based on the image of Arnold Schwarzenegger from the movie and features two newly developed head sculpts, a leather-like jacket licensed by Matchless, the oldest British brand of motorcycles and clothing, a detailed weapon, and an LED light-up figure base. $234.99 – Coming next week! – Preorder today and save $15! 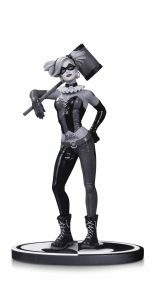 Lee Bermejo’s black and white vision of Harley Quinn is rendered in three dimensions in this new entry in the popular BATMAN BLACK & WHITE line of statues! $79.99 – Coming in August – Preorder today and save $10! SUICIDE SQUAD MOVIE STATUES – It feels good to be bad…Assemble a team of the world’s most dangerous, incarcerated Super Villains, provide them with the most powerful arsenal at the government’s disposal, and send them off on a mission to defeat an enigmatic, insuperable entity. U.S. intelligence officer Amanda Waller has determined only a secretly convened group of disparate, despicable individuals with next to nothing to lose will do. However, once they realize they weren’t picked to succeed but chosen for their patent culpability when they inevitably fail, will the Suicide Squad resolve to die trying, or decide it’s every man for himself? Based on the characters’ appearances in SUICIDE SQUAD! Each measures approximately 12″ tall. Each statue sold separately. $149.99 each – Coming in July/August – Preorder today and save $15! 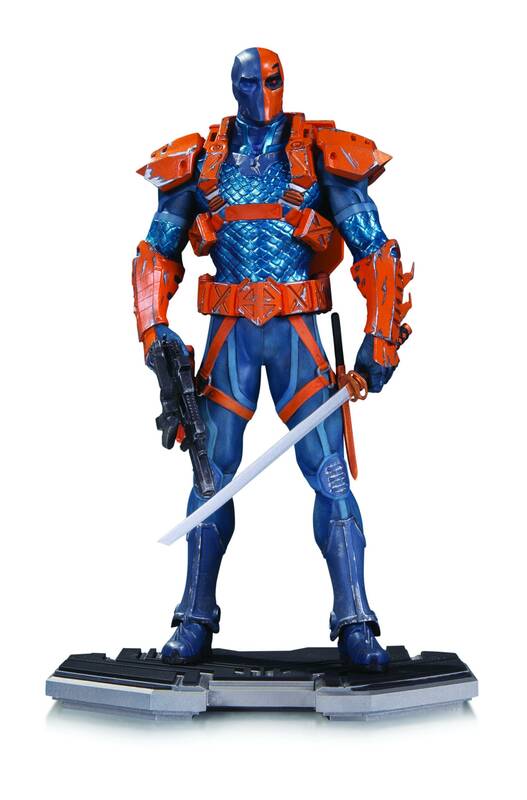 Deathstroke, the deadliest assassin in the DC Universe, can predict your every move! $99.99 – Coming in Late July – Preorder today and save $10! 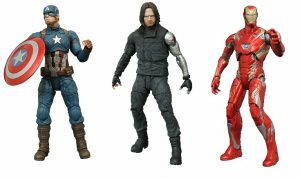 MARVEL SELECT CIVIL WAR ACTION FIGURES – A Diamond Select Toys Release! Whose side are you on? In Captain America: Civil War, Bucky Barnes, the Winter Soldier, joins his old friend Steve Rogers in opposition to Iron Man and other Avengers, leading to a superhero battle for the ages! This 7-inch action figure of the Winter Sldier features him in his newest look, as seen in Civil War, and features 16 points of articulation, as well as a rifle accessory and an Avengers Base diorama section. 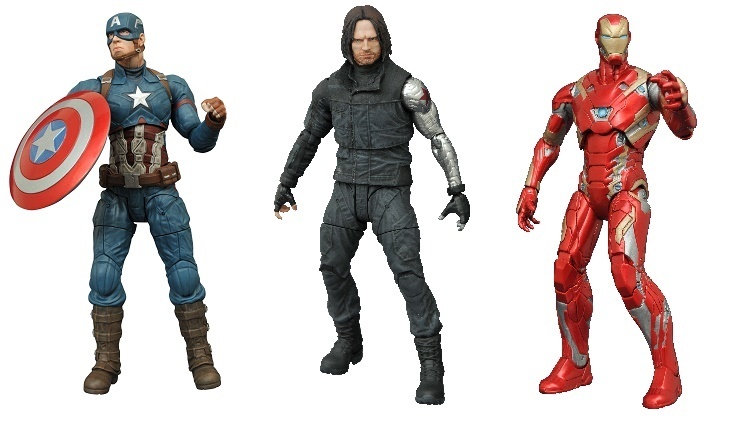 Collect all three Civil War figures to build the full diorama! 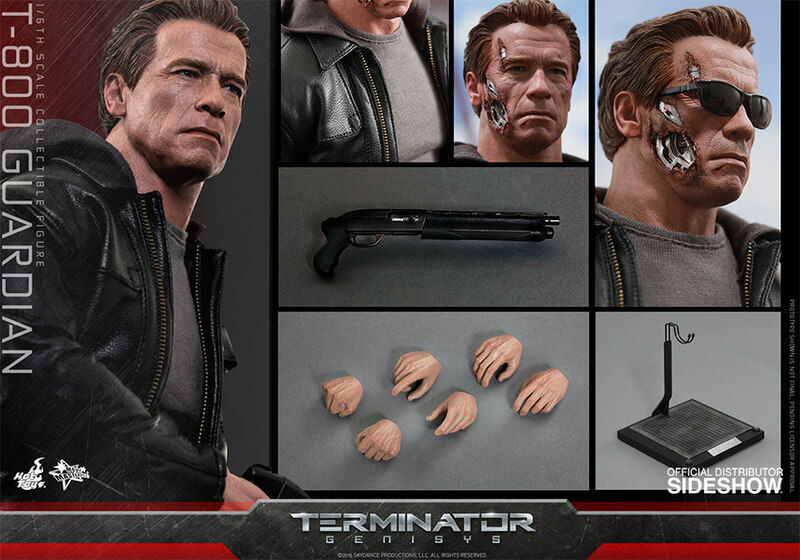 Packaged in display-ready Select figure packaging, with side-panel artwork for shelf reference. Sculpted by Gentle Giant Studios! $24.99 each – Coming May 25th – Pre-Order today and save $2.50! FEMME FATALES SUPERGIRL PVC FIGURE – Move over Superman, there’s a new Super-person in Metropolis! 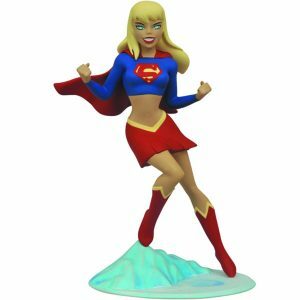 This exclusive Supergirl PVC statue shows her in her blue costume as she appeared in later episodes of Justice League. Supergirl measures approximately 9″ tall atop a diorama base and comes packaged in a full-color window box. 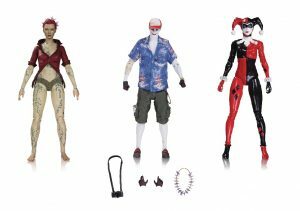 Produced in limited quantities for the 2015 Comic-Con International: San Diego show, limited quantities are now available. $49.99 – Coming in Late June – Preorder today and save $5! 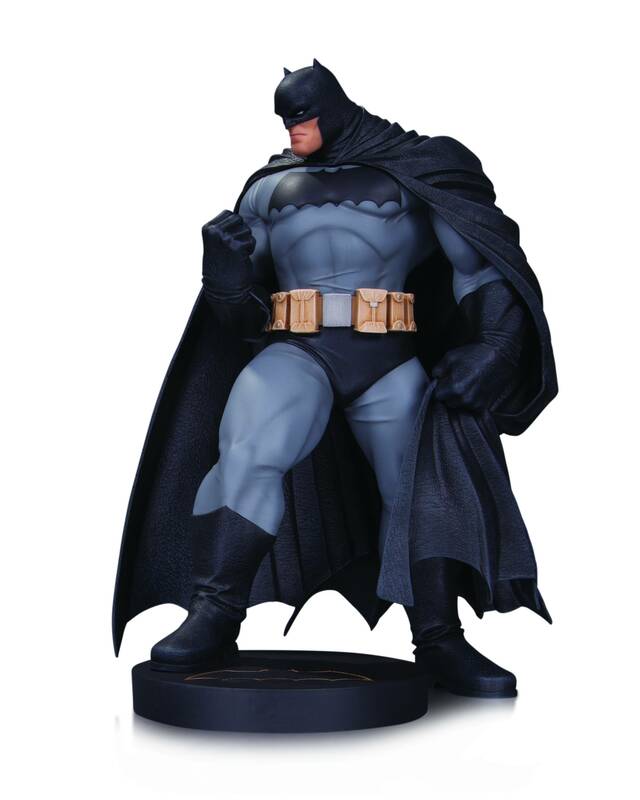 DC DESIGNER BATMAN STATUE – BASED ON THE ARTWORK OF ANDY KUBERT; SCULPTED BY ALTERTON Legendary writer/artist Frank Miller returned to the world of Batman in 2015 with the new miniseries DARK KNIGHT III: THE MASTER RACE, teaming with superstar artist Andy Kubert! Now, Kubert’s vision of the Dark Knight is rendered in three dimensions in this spectacular new statue. $149.99 – Coming in Late June – Preorder today and save $15! CAPTAIN MARVEL PVC FIGURE – A Diamond Select Toys release! Prepare to marvel at the new series of Femme Fatales PVC figures based on the heroines of the Marvel Universe! DST’s Marvel Femme Fatales line kicks off with none other than Captain Marvel herself, the heroine who lives up to her name alongside the Avengers, as well as on her own, thanks to her alien-derived super-powers. 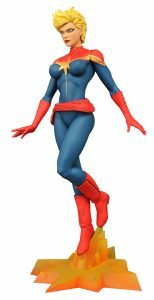 This static plastic figure of Carol Danvers is in 9″ scale, and features a detailed sculpt and an exacting paint process. She comes packaged in a full-color window box, and will soon be joined by more of the women – and men – of the Marvel Universe! Sculpted by Alejandro Pereira! $44.99 – Coming in Late April – Preorder today and save $5! 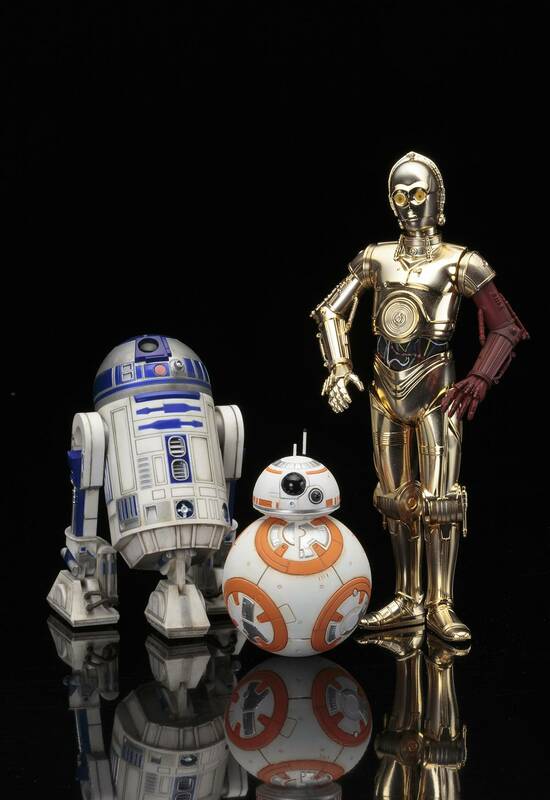 C-3PO/R2-D2/BB-8 DROID STATUE SET – Kotobukiya’s lineup of amazing figures from STAR WARS Episode VII: The Force Awakens continues with fan favorites C-3PO, R2-D2, and BB-8! Artoo and Threepio are updated to reflect their appearance in the latest film. These 1/10 scale figures assemble easily and quickly with snap-fit assembly: no glue or painting required. Artoo and Threepio feature magnets in their feet for added stability on the included base, and even BB-8 includes a magnet to help keep him in place. $109.99 – Coming in Late July – Preorder today and save $15! LADY THOR PVC FIGURE – A Diamond Select Toys Release! Time to put the hammer down! 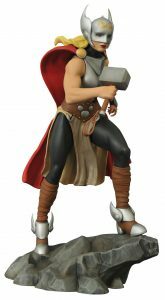 The second release in DST’s all-new Marvel Femme Fatales PVC Figure series is none other than the goddess of thunder herself, the all-new, all-different Thor! Measuring approximately 9 inches tall, this PVC figure of the mysterious new Thor perches atop a rocky outcropping, as if preparing to take flight or summon a lightning bolt from the heavens. Packaged in a full-color window box. Sculpted by Sam Greenwell! $44.99 – Coming in Late May – Preorder today and save $5! 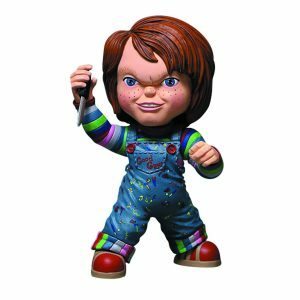 GOOD GUY CHUCKY DOLL – Who wants to play? Chucky does, but you may not like his game. The award-winning designer team at Mezco have created an all-new sculpture that not only captures the look of Chucky, but the very essence of his menace. Every detail has been captured; from his classic coveralls to the unique imprint of the soles on his sneakers. From his glistening, insane eyes, and his sneering lips, to his shocking red hair, this is Chucky at his most iconic. He’s not fully human, but he is fully insane! The star of five Child’s Play films, Chucky features 7 points of articulation. He also comes with a knife that he is sure to use for no good. Each Chucky comes packaged in his own collector friendly window box, so he can watch you and plan his attack. $22.99 – Coming in Late May – Preorder today and save $3! SON GOKU REAL MCCOY REPAINTED STATUE – From Megahouse. Son Goku rushes into battle in this Real McCoy Desktop Statue! 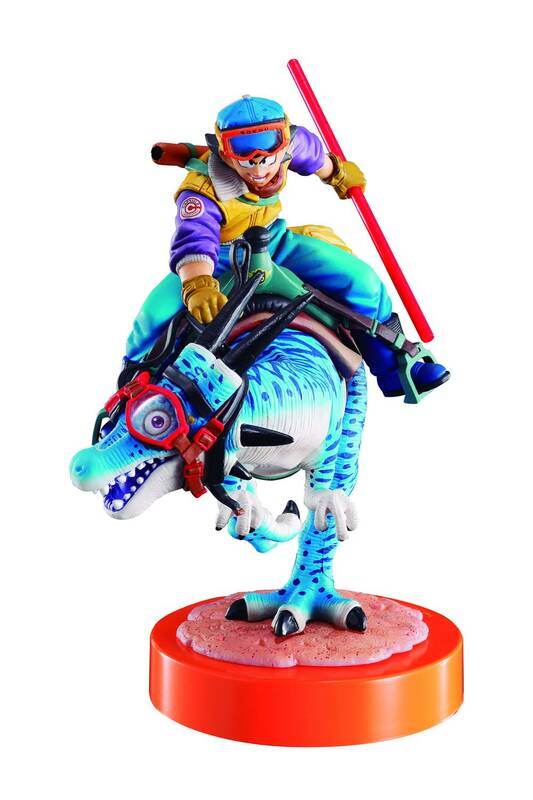 This repainted and redesigned version of the best-selling statue depicts Son Goku, dressed for the harsh winter clime, astride a mighty and improbable snow lizard beast. Atop a display base, Dragon Ball Z‘s Son Goku stands 5 7/8″ tall. $70.99 – Coming in Late April – Preorder today and save $6! RAVEN COVER GIRLS STATUE – DESIGNED BY STANLEY “ARTGERM” LAU; SCULPTED BY KAREN PALINKO The New Teen Titans’ most mysterious member, Raven, is ready to cast her spell in this new Cover Girls statue designed by Stanley “Artgerm” Lau! ARKHAM KNIGHT ACTION FIGURES – Three of the Dark Knight’s greatest foes are back in new action figures based on their appearances in the best-selling Arkham Knight videogame! $27.99 each – Coming in August – Preorder any one today and save $3 on each! This entry was posted in General Info on April 14, 2016 by admin.